CLAN INEBRIATED started in 2002 at a Celtic event when Dennis Strawhun pulled out his flask to have a wee dram. He noticed the three other guys standing with him did the same. As he raised his flask and said, “Here’s to team inebriated.” One of the other blokes standing next to him said, “No…You’re of Scottish descent, so here’s to CLAN INEBRIATED!” With that toast a new “unofficial” Clan was born. Clan Inebriated began as a parody on the traditional Scottish Clan system. It was a fun way of sharing Scottish heritage and a sense of belonging to those who did not necessarily come from Scottish decent, or have an active Clan Society to whom they could belong. Many friends were made, and important connections developed during the formative years. The popularity of Clan Inebriated grew quickly, and so did a contempt of the organization by a very small minority of individuals who were insulted by the word “Inebriated.” Simply, a first impression was formed that the organization was about intoxication, and rowdy drunken behavior. To the contrary, nothing could be further from the truth. The organization is about family and friends, and about sharing and promoting our Scottish / Irish heritage. In fact, children were (and still are) a regular part of the fun we enjoy while participating in various Celtic events. 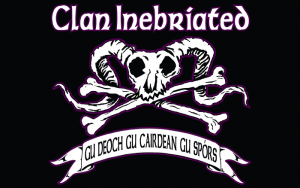 Clan Inebriated became a legitimate organization in February 2007, after slowly gaining momentum amongst the clans and others who share a similar sense of humor. Owned and operated by its original founder and Clan Chief, Dennis Strawhun and his wife Kelli, Clan Inebriated incorporates the fun and festivity one can only share with good friends and kin. Moreover, their passion and desire to continue promoting and hosting Celtic events delivers a enthusiasm and excitement that is second to none. The tartan you see throughout this website was designed by Dennis Strawhun and the Clan Commander, Todd Greer. As the Strachan surname (Strawhun spelt correctly!) is derived from the Grampian Highlands of northeastern Scotland, Dennis and Todd thought it only proper to incorporate a Deeside twist to the design. Hence, the blue and the gray piping were added to the CI purple in the tartan. In keeping with our parody on the Scottish Clan system we designed our own clan badge. This badge historically was worn by the Clan Chief, and was part his Arms. Members of the clan were given permission to wear the badge as a symbol of their participation and belonging in the clan. We have chosen to lampoon the Scottish Royal flag with the Rampant Lion by having a Rampant SHEEP. Our clan motto “Gu Deoch, Gu Cairdean, Gu Spors” (goo jock) (goo carjen) (goo spoors) was translated into Gaelic rather than Latin at my clansmen’s request. It is translated as “To Drink, To Friends, To Fun.” To be blessed with friends and family that you share something in common with, and enjoy being around is a gift that is unparalleled that should never be taken for granted. Our members include professionals, doctors, lawyers, police officers, musicians, actors, inn keepers, clergy, Protestants, Catholics, an Army Brigadier General,REAL Scottish Clan Chiefs including…The 20th Earl of Caithness Malcolm Sinclair, Lord Simpill (who is putting on the Gathering 2009 in Edinburgh) and Sir Ian MacDonald of Sleat of the Clan Donald. We have members who are true tea-totalers who do not imbibe a drop, as well as wee bearins (babies). After all, who is more full of life and wonder than a baby. Young Fin Shaw (who’s father is Aaron Shaw – the piper for the Wicked Tinkers) is to date our youngest member. Perhaps our most famous clansmen was an actor in the movie “Revenge of the Nerds” who played the character “Booger,” also known far and wide as Curtis Armstrong of the Clan Armstrong. Curtis is a proud member of Clan Inebriated, a good friend and family man. The Tinkers music is what you listen to when you open our site. In fact, all of the Tinkers are proud members of Clan Inebriated. The Tinkers being the official Scottish band of the Clan Inebriated, while “The Angry Brians” are the official Irish band for our wee group. (The song on this page was written by Clan Chef Dennis and sung by The Angry Brians) Well, we could go on and on with others who are like us, but we would rather see YOU join us when we gather, share a laugh, and maybe a dram or two. Finally, don’t forget to hug your fellow clan members! Its God’s way of making us all feel good!